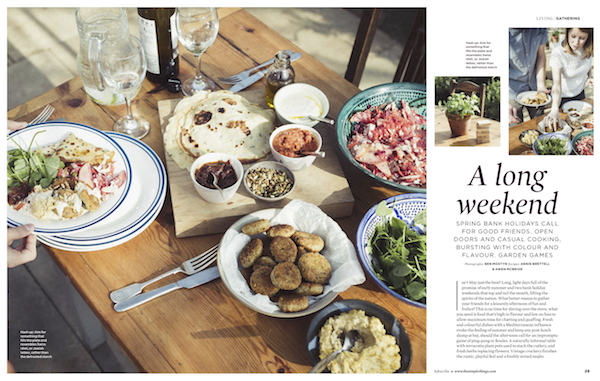 Rustle up a weekend menu for family and friends - that just so happens to be vegetarian - then get the garden games out. Long, light days full of the promise of early summer and bank holiday weekends that top and tail the month - isn't May just the best? This is no time for slaving over the stove, though. What you need is food that's high in flavour and low on fuss to allow maximum time for chatting and quaffing. Fresh and colourful dishes with a Mediterranean influence will keep any post-lunch slump at bay, should the afternoon call for an impromptu game of ping-pong or boules. Opt for an informal table with terracotta plant pots holding the cutlery and fresh herbs replacing flowers. Vintage crockery finishes the rustic, playful feel, while a freshly mixed mojito delivers a touch of holiday decadence. Double bank holidays - we'll drink to that. Combine all dressing ingredients, adding to the salad before serving. For more information about National Vegetarian Week, including tips on how to go meat-free, visit the website.